The increasing destruction and fragmentation of natural habitats has greatly hampered the natural movement patters of wild animals. It is no surprise that animals often find themselves in human-dominated landscapes as they try to move from one suitable habitat to another. The increasing loss in the quality of habitat remaining and lack of connectivity between habitats also makes the animals much more visible on their journey to better pastures, while increasing pressures and intense human activity in fringe areas also results in flushing the animals out of protected areas. In most cases, once left alone, the animal will soon move back into its original habitat. There may be other times when an animal’s presence itself may be frightening or threatening to both, the animals and humans, and it may be desired that such an animal be driven back into the forest. For example, the movement of elephants through a village or the presence of a large carnivore can be extremely frightening. While it may be best to incorporate preventive measures in places that are predisposed to such occurrences, the animals may be driven away by the use of harmless devices such as firecrackers, banging utensils, etc. As a last resort, the animal may be physically captured and returned to the forest. Such measure undertaken by the respective authorities with the help of trained professionals. Animals that have been trapped or cornered must be approached with extreme caution. They may be extremely scared and agitated and likely to attack the first person that comes in their view. They won’t recognize you are a ‘rescuer’ or someone who intends to aid them but see you as a threat and attack in defense. Such situations must only be handled by trained professionals to prevent accidents. Certain species are more likely to be visible or stray in human dominated landscapes only during certain seasons or during natural disasters like floods, wildfires, etc. Since the occurrence of such disasters seems to have accelerated in recent years, the animals can do with all the help they can receive at such times. Other species are predisposed to straying out only during certain seasons. For example, snakes may be very visible in the summer months when the day temperatures peak, or during heavy rains as they are forced to leave their burrows in search of higher ground. Birds are unique amongst animals in that they are not restricted by geographical/terrestrial barriers and are hence least likely to ‘stray’ into human dominated landscapes. Another advantage of birds is that they can ‘rescue’ themselves before they run into further impediments. A bird that allows itself to be caught is more likely in distress due to another underlying cause or is a fledgling or a young inexperienced bird that has lost its way. While some species are more likely to be noticed simply because of their lifestyles or habits, urban wildlife is more likely to come into notice than forest dwelling ones simply because of their proximity to people. For example, barn owls may sometime be extremely visible simply because of their willingness to roost in modern buildings without adequate cover. Even once discovered by humans, they are very reluctant to take off during the day for fear of attack by crows. By dusk, they take off into the security of the darkness once again. Although such a situation demands the simplest of solutions – leave the animal, move out of its way and clear an escape route. Catching a strayed animal is not difficult but rather unnecessary and must always be a last resort. In most cases, it is usually the larger and more dangerous animals that people are concerned about. A healthy wild animal is very difficult to catch unless it has been cornered, trapped (or got itself into a place it can’t get out of) or tranquilized – such situations are extremely stressful for wild animals and must be avoided unless absolutely necessary. Often, accidents may simply be avoided by following the advice of professionals and giving the animal some time to leave the area. Gather as much information and prepare yourself accordingly before heading to the location of the animal. Work out a fool-proof plan before jumping into action. Your actions must involve minimal time with the animal and the least amount of time chasing it. An animal may be caught by simply physically restraining it, if it is safe for both the animal and the handler, or it may be chemically restrained (by a trained licensed veterinarian) and securely restrained before administering the reversals. Once an animal has been caught, it will have to be put somewhere. Appropriately sized cages or crates must be made available before attempting to catch any animal. Appropriately sized vehicles must also be ready to transport the animal before capturing it. Leaving an animal trapped in a cage surrounded by people will only add to its stress and increase the chances of accidents and injuries to both the animal and the people around. Once captured, no people/dogs must be allowed near the cage as it will only scare the animal further. Stress is a vital component of survival instincts. It is an instinctive response to a stressor and creates a ‘fight or flight response’ that is essential for an animal’s survival. While this response is the key to an individual’s survival in situations that require a quick response, prolonged periods of stress can have a dangerous impact on an animal’s physical and psychological wellbeing and increasing its susceptibility to disease or even resulting in death. Capture myopathy is a condition associated with capture or handling of any wild animal. It frequently occurs after prolonged or intense handling of wild animals or during long chases to capture them. It may be seen preacutely – immediately, acutely – within minutes, or chronically – in hours, days or weeks. •	If the animal survives, the residual signs may last as long as a month. Capture myopathy is nearly impossible to remedy and is best avoided though prevention. Ensuring the use of appropriate methods of capture and handling will prevent the onset of capture myopathy in most cases. Don’t just chase an animal expecting to catch it when it tires. Have a good plan before attempting to catch an animal and spend minimal time chasing the animal and more time in planning and preparation. A chase must always be avoided in the intense heat (peak summer, mid-afternoons) as it only adds to stress and accelerates the ascent of capture myopathy. Thus is a perfect solution for animal’s that need to be handled intensively and may not permit safe handling without the use of capture drugs. It reduces struggle and the stress associated with it, and is especially useful for large or overly aggressive animals. N.B. No animal under the influence of drugs must ever be released until it has regained full consciousness. An animal’s body is likely to heat up not only after a chase but when it is extremely excited or stressed as well. Environmental heat will only worsen the animal’s condition. Keep the animal’s body temperature down by using water or damp cloths when necessary – whichever is more appropriate for the species in concern. Placing the animal is a cool, shaded and well-ventilated area will also help to bring down its body temperature. ‘Stress’ is defined as a ‘response to a stressor’. A primary concern during handling and transport is to reduce the number of stressors, i.e., stimuli. This can easily be achieved by using blindfolds, ear muffs, and keeping the animal in a dark and quiet place. Please refer to our page on Housing and Transportation for more information. Catching smaller animals [only when necessary; please DO NOT handle wild animals for fun or “training”] can be achieved with simpler equipment. 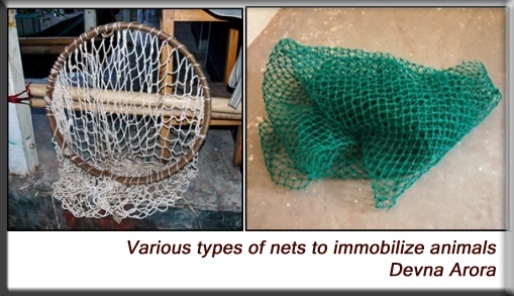 Using nets and towels or sheets are often adequate to both trap and handle small animals. 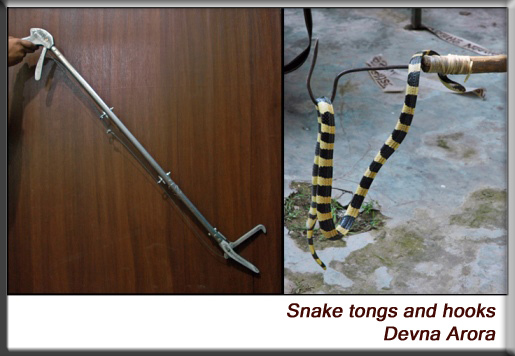 Snakes may be simply be removed from dangerous situations using snake hooks or tongs. 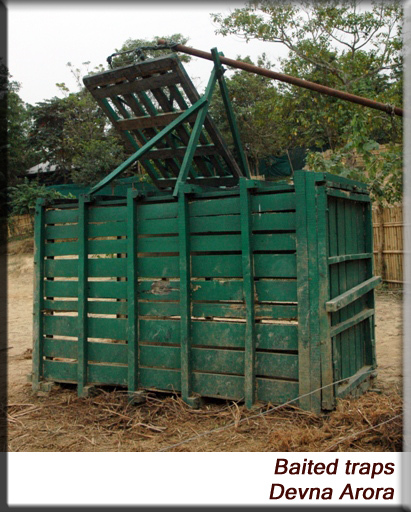 Small baskets, cages or bags may be used to transport such animals. Handling must always be done by trained professionals as you may unintentionally hurt the animal during rescue. Such procedures require large teams to handle and monitor the capture program. Capture drugs and delivering equipment (baits, jab-sticks, blow pipes and tranquilizer guns) must only be used by trained veterinarians as they not only have to inject the drug but also monitor the animal post-injection of the drug. Larger crates and vehicles must be available to transport such animals.